When we got to the school, we climbed aboard Kirby’s boat and set off into the beautiful waters of Lake of the Ozarks. Kirby explained the basic instructions and gave us a safety lesson. Shea was the first one to give it a try and she was a natural! She was able to get up on the very first try and kept going for several seconds. I was so proud of her! There is nothing like seeing your child achieve a new skill! The smile on her face said it all. Shea took a few turns before giving her big sister a chance.My girls love the water and my younger daughter, Shea, is especially adventurous. 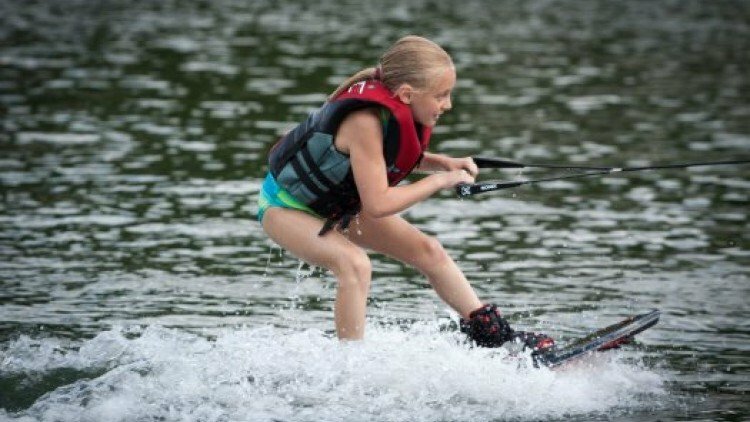 She couldn’t wait to try wakeboarding with Kirby Liesmann, professional wakeboarder. My daughter Dunovan was just as excited…or do they say “stoked” for activities like wakeboarding?! Dunovan did equally as well and Kirby was really encouraging. He gave the girls tips to improve with each turn. It was easy to tell that Kirby taught wakeboarding lessons regularly. He broke down the steps for the girls and was really patient with them as they practiced. Every time the kids were able to get a new skill down, he was their biggest cheerleader…besides me of course! Kirby offers a variety of lessons for all levels. Make sure you ask him about how he got into wakeboarding. 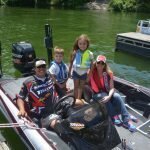 He has a really cool story to share about how he became a professional wakeboarder. After our lesson, he showed us how a pro wakeboards! He did flips and huge turns in the air doing some really cool stunts. It was obvious he had years of practice. When you go to Lake of the Ozarks for vacation, I highly recommend adding a wakeboarding lesson with Kirby’s School of Wake. You will make family vacation memories to last a lifetime! If you are looking for another high adventure water sport, you might want to try flyboarding at Iguana Watersports. With nozzles under your feet, flyboarders zoom into the air, twist and turn, then dive back into the water! We let the cameras roll while teenagers showed us their moves. It was a little too daring for us, but we really enjoyed watching the guys do their stunts in the air and under the water. If you have older kids who love adventure, flyboarding might be just the ticket. • Iguana Watersports also rents a variety of boats and sea doo watercraft. • Wakeboarding lessons could be a fun Christmas or birthday gift.